Here are some additional news & notes regarding the Packers’ selection of Delaware North Companies Sportservice as the new food and beverage provider for Lambeau Field. 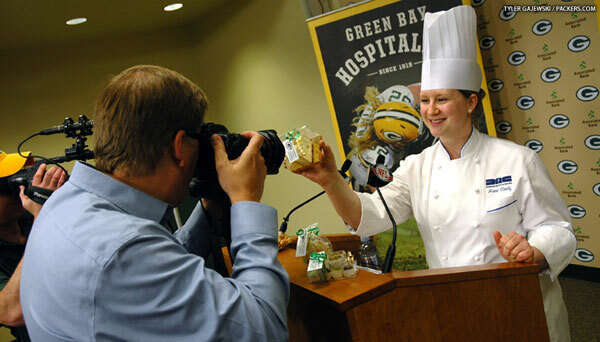 –Packers Vice President of Sales and Marketing Tim Connolly said that companies began “courting” the Packers as long as 18 months ago with the knowledge that the organization’s contract with Levy Restaurants was expiring in 2012. During the course of the formal search process, the Packers received eight fully detailed proposals, narrowed it to four finalists and ultimately chose DNC Sportservice. Connolly noted that two of Sportservice’s other NFL contracts made him take note. One is the deal with MetLife Stadium, home of the Giants and Jets, and Sportservice has shown the ability to keep both stadium clients happy simultaneously. The other is with the Carolina Panthers, whose owner, Jerry Richardson, made his fortune in the food industry and chose DNC Sportservice when the Panthers went from in-house food service to an outside vendor. “That made an impression on all of us,” Connolly said. Abramson also said Sportservice is working in conjunction with the Packers on a new point-of-service system to improve the speed of concessions service during games. –Packers Director of Stadium Services Jennifer Ark said concession prices, as usual, won’t be set until close to the start of the season. The Packers will collaborate with Sportservice to set the prices. DNC Sportservice’s contract officially begins July 1. –Online access key: The Packers sold more than 268,000 shares this time compared to around 120,000 in the 1997 stock sale, and Murphy said the key was the ability to sell online this time. He said more than 90 percent of the sales were made online. “That was obviously crucial to us,” he said. –Shareholder meeting: In past years, the Packers have allowed shareholders attending the annual meeting in late July to bring as many as four guests. As the organization looks at the logistics for this year’s meeting, Murphy said that guest number will have to be reduced because the total number of shareholders has now more than tripled. “Hopefully we can structure it in a way that we’ll know well beforehand, or have a good idea what the attendance will be,” he said. For the original story on the closing of the stock sale, click here. The Packers have won 13 NFL championships, the most all-time, and the club’s .644 postseason winning percentage (29-16) is the best in NFL history. Green Bay currently has 29 playoff wins. With a win Sunday against the Giants at Lambeau Field, the Packers can become the third team to record 30 postseason victories in NFL annals, joining the Pittsburgh Steelers (33) and Dallas Cowboys (33). Green Bay Packers fields manager Allen Johnson and his staff are in the midst of a busy week of preparing Lambeau Field for Sunday’s 3:30 p.m. CT showdown between the Packers and New York Giants. 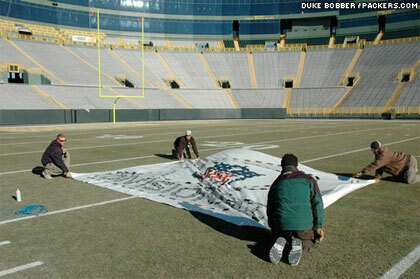 The crew painted the Divisional Playoffs logo along both sidelines Tuesday afternoon. Click here to see photos of the process. With their victory over the Atlanta Falcons, the New York Giants earned a trip to Lambeau Field for the NFC divisional playoffs against the Packers at 3:30 p.m. CT next Sunday. Seeded fourth in the NFC, the Giants (10-7) beat the Falcons 24-2 in a wild-card game on Sunday. The Packers (15-1) are seeded first in the NFC and had a first-round bye. No. 2 seed San Francisco (13-3) will host No. 3 seed New Orleans (14-3) in the other NFC divisional game, scheduled for 3:30 p.m. CT Saturday. The winners of the two divisional games will meet in the NFC Championship on Sunday, Jan. 22, at the site of the highest remaining seed. The Packers, as the No. 1 seed, would host the conference title game should they get there. Next Sunday’s Packers-Giants game will be the second meeting between the teams this season. Back on Dec. 4, the Packers won, 38-35, on a last-second field goal at MetLife Stadium. The Packers and Giants last met in the playoffs following the 2007 season in the NFC title game. The Giants won that game, 23-20 in overtime at Lambeau Field, to advance to the Super Bowl. The upcoming game will mark the seventh postseason meeting all-time between the Packers and Giants. The Packers are 4-2 in the previous six meetings, beating the Giants for the NFL Championship in 1939, ’44, ’61 and ’62. The Giants beat the Packers for the NFL title in 1938 and in the NFC Championship four years ago. 18.6 – Average points Green Bay has allowed this season at home. The Packers have scored an average of 39.4 points per game at Lambeau Field in 2011, which ranks No. 2 in the NFL. The club’s record for scoring average at home is 38.0, set in 1942. 6 – The Packers can become only the sixth team in NFL history to finish a season 15-1. 17 – Passing attempts by Aaron Rodgers the last time the Lions visited Lambeau Field, Oct. 3, 2010. It was the fewest attempts by the QB in a game he finished since he took over as a starter in ’08. The Packers prevailed, 28-26, with Rodgers’ 16-yard scramble helping the club run out the final 6:32 of the contest. In the ’10 victory over Detroit, he recorded a passer rating of 105.3. Rodgers completed 12 passes vs. the Lions, tied for the fewest in his career (vs. Seattle, 12/27/09). The only game where Rodgers has thrown or completed fewer passes was last year at Detroit (7 of 11, 46 yards), when he departed in the first half with an injury. 2002 – The last year Green Bay went undefeated at home. The Packers enter the finale with a 7-0 record at Lambeau Field. Green Bay is one of three teams unbeaten at home this season, joining the Ravens and Saints. 3 – Charles Woodson has returned an interception for a touchdown vs. the Lions each of the last three years. Woodson picked off a pass in the Thanksgiving game at Detroit, no touchdown. The cornerback’s feat of three-straight seasons is an NFL record. 1,089 – Rushing yards combined between running backs James Starks (578) and Ryan Grant (511). 5 – Both the Packers and Lions have lost only five fumbles in 2011. 385 – Completions by Matthew Stafford this season. Rodgers has completed 343 passes. The Detroit QB has 604 attempts, Rodgers has 502. Stafford has set team records with 4,518 yards and 36 TDs. The Packers gave their fans a Christmas gift in the form of home-field advantage throughout the playoffs, with a 35-21 win over the Chicago Bears on Sunday night. Quarterback Aaron Rodgers was the star of the game, throwing for five touchdowns before giving way to backup Matt Flynn in the fourth quarter. Rodgers has 45 touchdown passes this season and is five touchdown passes away from tying Tom Brady’s all-time single-season record of 50. The win improved the Packers’ record to 14-1 with one regular-season game remaining, against the Detroit Lions at Lambeau Field on New Year’s Day. The Packers will have a first-round playoff bye and then host a game in the divisional round of the NFC playoffs on either Jan. 14 or 15. Chicago rushed for 199 yards and was led by running back Kahlil Bell’s 121 yards rushing. Quarterback Josh McCown was making his first start of the season and the Bears were successful in writing him out of the script until the Packers moved out to a 28-10 lead in the third quarter. The Packers committed no turnovers and no penalties, and the Packers defense stiffened when the Bears moved into scoring territory, but 441 yards of offense by a Bears team that has been struggling to move the ball and score points since losing quarterback Jay Cutler, is a concern for a Packers defense that is ranked 31st in the league. Jordy Nelson led the Packers with six catches for 115 yards and two touchdowns. James Jones also caught two touchdown passes; Jermichael Finley caught one. Chicago dominated time of possession by more than 10 minutes, but the Packers made the big plays. It was a touchdown drive in the final two minutes of the first half that gave the Packers their first comfortable lead, 14-3 at halftime. “Now we’re going to enjoy the rest of Christmas with our families,” Rodgers said after the game. Stay tuned to packers.com as it updates its coverage of tonight’s game. 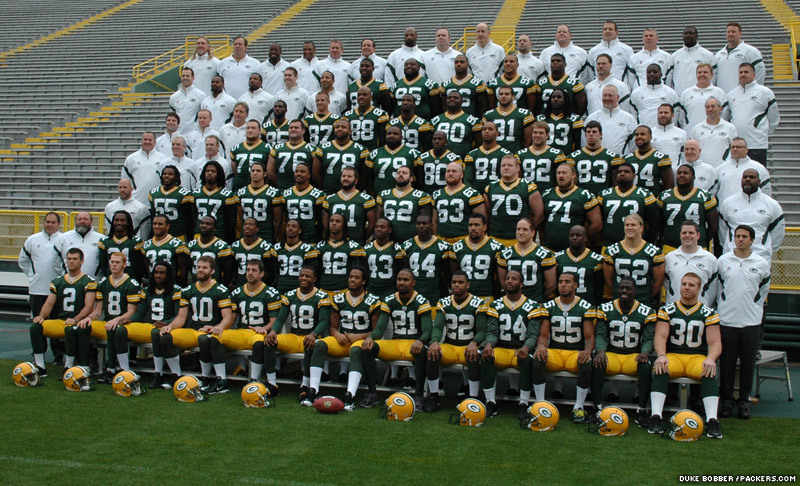 As the Packers returned from their bye week, but before taking the practice field, the annual team photo was taken inside Lambeau Field on Monday morning. With cloud cover in Green Bay, the photographers caught a break, not having to deal with sunlight-caused shadows that can create lighting issues. After the photo, the players quickly returned to the locker room to get ready for practice, which was scheduled to begin at 11:15 a.m. It’s the team’s first on-field workout since before the Minnesota game on Oct. 24.